With the onset of the summer vacations, probable activities that are worthwhile start lurking in one’s head. It was then that I came across a flier which read “King’s comes to you! King’s College London and Miranda House welcome you! Apply now!” And it certainly was one of those moments when I realized the perks of studying in a prestigious college like Miranda House and in the University of Delhi. The King’s College London Summer School at Delhi was organized in collaboration with Miranda House, University of Delhi and Think Education, an educational organization which works to create opportunities for promising students worldwide. It was a high quality and intensive academic programme open to students from around the country. The session 1 was held from 4th June-14th June 2013, and the session 2 from 17th June – 28th June 2013. It was in the first session that I studied the spectacularly interesting subject of International Relations. 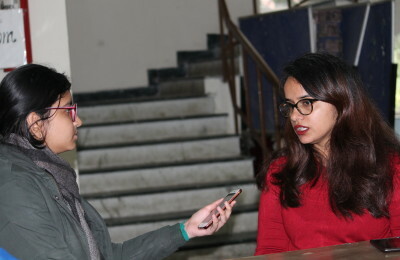 The concept of a ‘summer school’ being a new one to the students of the University of Delhi was met with looks of apprehension; yet the KCL session saw around 80 students from various universities in attendance. Our tutor for this course was Dr. Diana Bozhilova, a Visiting Research Fellow at the Centre for Hellenic Studies at KCL, and also a dynamic lady with amazing knowledge in a subject which takes one years to study. Being an absolute newcomer to the varying subjects of Political Science, Economics, Philosophy, Law and Sociology; most of us had trouble adjusting to the hefty curriculum, but the interactive approach and the alternating group activity plus lecture schedule made it all easily understandable and also enjoyable. We all breezed through heavy duty subjects like ‘global governance, international relations theory, the workings of the United Nations, historical origins of the European Union etc’. One afternoon we would make strategies to overcome problems in the European Parliament, whereas on another, build a clean city from scratch. We saw documentaries and videos ranging from sea piracy to that of a gender bias, which was definitely a wonderful break from the monotonous classroom sessions we all usually have to endure. The experience was one both mentally and emotionally enriching, as I made friends from places I never thought I would, with many of them here to stay. The summer school gave us an excuse to eat out, have fun, discuss theories over coffee and laugh over anecdotes recited by many of us. The summer school not only taught me what the study of International Relations means, but also helped me decide what I would want to pursue later on in life. It helped me experience what it means to study in a foreign classroom, in a completely different setting and with a vast curriculum. It really helped broaden my horizons; while having fun. This summer school is one experience which I would never forget. Given a chance, I would definitely attend it again. I can proudly say that I returned with a greater sense of self after attending The King’s College London Summer School at Delhi.